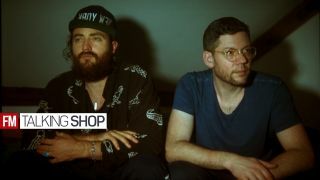 Having first come together to release a collaborative single back in 2012, the eclectic pairing of Berlin-based producer Frank Wiedemann (of Âme and Innervisions) and Australian songwriter Ry X, return this year as Howling, with their delicate, meticulously crafted debut LP Sacred Ground set to drop via Monkeytown and Ninja Tune's Counter Records offshoot early next month. Ahead of the album's release, and a run of live dates, we caught up with Wiedemann to chat about his studio set-up and his love of hardware. "I started making music when I was eight years old. I wanted to be a drummer first but my father convinced me to learn some harmonies first, which I did by having piano lessons. When I was finished with these, drum computers got affordable so my father bought us a TR-606 and a Roland JX-3P which were my first electronic instruments to play (not to forget a Solina organ my father had before, which explains my love for organs, maybe). After playing in different bands I got myself an Atari ST and started programming and composing in Notator with basic MIDI gear. I started with Jazz-Rock kind of music inspired by Joe Zawinul and Herbie Hancock." "My studio has grown over the last couple of years, as I might be a bit of a hardware maniac, although as I'm sharing the studio with Kristian (from Âme), Henrik Schwarz and Dixon I'm forced to keep the amount of gear as small as possible. Before we started sharing this space two years ago, my studio was at home. "I love hardware, not necessarily because I think the sound of a plug-in is not good enough, I just love to put my hands on and it inspires me much more than a mouse or trackpad. Also, my instruments aren't always regularly serviced, meaning they produce mistakes like, for instance, the Memorymoog, which is almost always out of tune, but that makes it a beast that no plug in can compete with. "For Howling recordings though, we recorded a lot on the road, in other studios or places like Ry's shelter in Topanga Canyon." "I've been working fully with Ableton for maybe eight or ten years. Before I used Logic and maybe Ableton via Rewire here and there. But when I started my live setup I completely switched, as Ableton is just more musical than Logic, more intuitive as well." "You can't ask this question to a gear nerd! But essentially I think it's the room, which has to be comfortable and cozy and free from distractions. You must have the feeling: I want to make music here, now! Our studio is like this, many places I recorded with Ry were like this. If you ask a lot of musicians, I guess they would tell you the same. A studio can be built totally against the rules with awful sound or acoustics, but if the vibe is good, the room is actually the most important thing to make good music." "A Roland Jupiter-4, which I'm very happy about. I sold my JP6 to a friend because I rarely used it as it was always a bit 'in between' for me - not as fat as the JP8 and a bit too clean. But the JP4 is very exciting and unpredictable, which I love!" "I would love to have a grand piano in our studio but I guess there's just no space! And the others would kill me (or even worse: force me to get my synths out of the studio!)" "It's always different. But for Howling I can say that nearly all the songs started with a session during a rehearsal or sound check. It was more about pressing "record" at the right time to capture the moment. From that initial idea we added instruments, melodies and beats that came into our minds and sometimes replaced them later with other instruments or sounds. But the core started like that." "I've just finished two remixes under my own name and will start working with Kristian on new Âme material after our holidays. And I have to prepare my set up for the Howling tour, which starts in May." "If it's just your own studio or Abbey Road studios, if it's an old farm somewhere in the middle of nowhere or a roof top in New York. Find a place where you love to be and make music. And if you work home make your room a great room where you feel inspired!" It's not about the gear but what you do with it! "Remember when Techno started? The inventors used the cheapest drum machines and synths they could afford at the time to make something new. They used the 909 and the 303 because they were cheap in those days, and they created a whole new genre of music! What I'm trying to say is: it doesn't matter if you've got a Neve console, an Arp 2600 and a Fairchild compressor, it's really just about what you do with it. If it's plug-ins or a cheap organ you bought at the junk yard - it's really only about your creativity!" Make music with other people! "It's so much fun to make music with other people, and besides, you can learn so much from them. Every producer works different and just by watching somebody else using your DAW or equipment you'll learn many new things. It was always inspiring for me to play with other musicians. Sometimes even challenging… but that's a good thing too!"